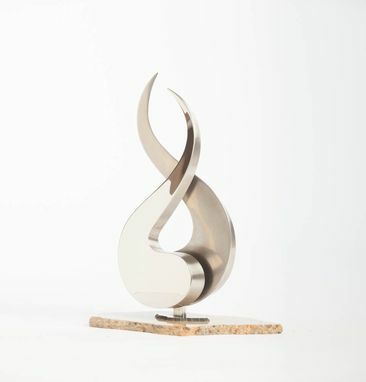 A contemporary, & elegant piece of Stainless Steel Art from Jon Koehler Sculpture. Honor your employees and your clients with a custom designed recognition award. This piece is Made-to-Order and each is one of a kind. Since it is made to order you have input as to any specific elements you want focused on, creating your own piece. The range for this sculpture style is 8-10inches tall and 4-6 inches in width. Please email me with any questions and specifications prior to ordering. Each creation is made from start to finish one at a time. I will email you a picture of the final piece for your approval before shipping. Rush Order for an extra fee. I will contact you if longer time is required. I look forward to working with you to create a piece of timeless art.